Roquan Smith: Smith returned his first NFL interception 22 yards and he posted six tackles for the Bears. Smith ranks 16th in the NFL and third among rookies with 97 tackles. He is fifth among rookies with four sacks. Leonard Floyd: Floyd had two tackles, including one for loss, a quarterback hit and a pass defense for Chicago. Javon Wims: Wims was a healthy scratch for the Bears. Todd Gurley: Gurley had 11 rushes for 28 yards and three catches for 30 yards for Los Angeles. Gurley leads the NFL in rushing touchdowns (15) and total touchdowns (19) and is second in rushing yards (1,203) and scoring (120 points). Ramik Wilson: Wilson was on 13 special teams plays for the Rams but did not record any stats. Matthew Stafford: Stafford went 15-of-23 for 101 yards for Detroit. Stafford is 15th in the NFL in passing yards (3,187) and is 18th in touchdown passes (18). Last week, Stafford was selected as the Lions’ nominee for the Walter Payton Man of the Year Award. The award is presented annually to recognize outstanding community service activities off the field as well as excellence on the field. Benjamin Watson: Watson had three catches for 24 yards as the Saints clinched the NFC South title. Alec Ogletree: Ogletree had an 18-yard interception return and led the Giants with eight tackles. Ogletree is fourth in the NFL with five interceptions, including three in the last two weeks. Lorenzo Carter: Carter had five tackles, including a sack, for New York. Carter is 12th among rookies with three sacks. John Jenkins: Jenkins was a healthy scratch for the Giants. Reshad Jones: Jones posted five tackles and defended one pass for Miami. Sony Michel: Michel carried 20 times for 57 yards for the Patriots. Michel is fourth among rookies in rushing yards (706), 18th overall and fourth among rookies in rushing touchdowns (five), sixth among rookies in total touchdowns (five), and 10th among rookies in points (30) and yards per game (75.6). David Andrews: Andrews started at center for New England, which rolled up 421 total yards. Corey Moore: Moore was on 11 special teams plays for Indianapolis but did not record any stats. Nick Chubb: Chubb had 13 carries for 66 yards and a touchdown along with four catches for 17 yards for Cleveland. Chubb is 15th in the NFL and third among rookies with 760 rushing yards, eighth overall and third among rookies with eight rushing touchdowns, 12th overall and second among rookies with 10 total touchdowns, fourth among rookies with 60 points, and 11th among rookies with 70.0 yards per game. Orson Charles: Charles had a 9-yard reception for the Browns. Thomas Davis: Davis recovered two fumbles and recorded six tackles for Carolina. Jordan Jenkins: Jenkins had two tackles, including one for loss, for New York. Isaiah McKenzie: McKenzie had four rushes for 22 yards, including a 15-yard touchdown run, for Buffalo. He also caught four passes for 47 yards and returned five kickoffs for 101 yards. Chris Conley: Conley had two catches for 13 yards as Kansas City clinched a playoff berth. Justin Houston: Houston had six tackles, including 1.5 sacks, for the Chiefs. On his solo sack, Houston forced and recovered a fumble. Ben Jones: Jones started at center for the Titans, who rolled up 426 total yards (including 264 rushing) and averaged 7.5 yards per play. Abry Jones: Jones was inactive for Jacksonville due to a shin contusion. Shawn Williams: Williams notched six tackles for the Bengals. Williams is sixth in the NFL with four interceptions and is 18th in the league with 89 tackles. Clint Boling: Boling started at right tackle and helped the Bengals roll up 295 total yards. Geno Atkins: Atkins had one tackle for Cincinnati. Cordy Glenn: Glenn was inactive for the Bengals due to a back injury. ATHENS, Ga. — Georgia senior defensive back Deandre Baker has been named to the 2018 Associated Press All-America First Team while sophomore left tackle Andrew Thomas has been included on the AP All-America’s Second Team. Baker, a Miami, Fla., native, became the first Bulldog to win the Paycom Jim Thorpe Award last week for being nation’s best defensive back in college football. He was also a Walter Camp First Team All-American. 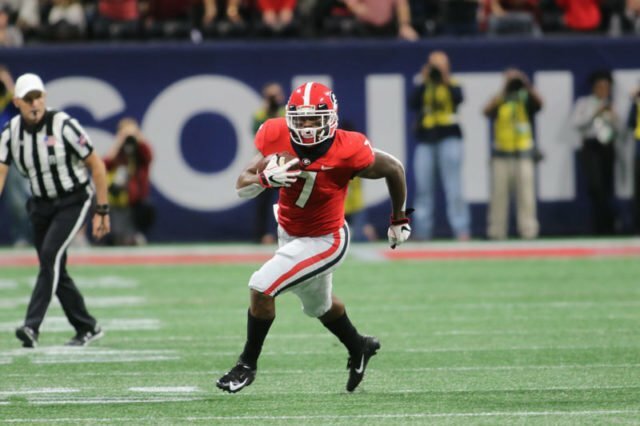 Thomas, a native of Lilburn, Ga., was named to the Walter Camp All-America Second Team as well. 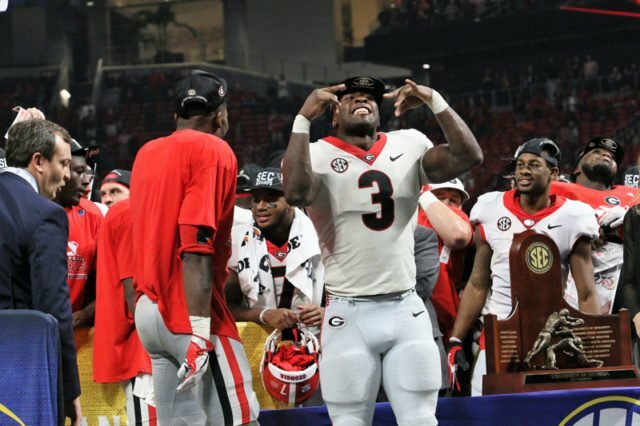 Baker becomes the first Georgia All-American from the defensive backfield named to the AP’s First Team since Bacarri Rambo in 2011. A Miami, Fla., native, Baker has started all 13 games for Georgia and has 40 tackles and is tied for the team lead with two interceptions. He also has a team-best 10 pass break-ups. In addition, Baker has a forced fumble and has collected a fumble recovery for a defense that ranks 15th nationally allowing just 18.5 points per game. 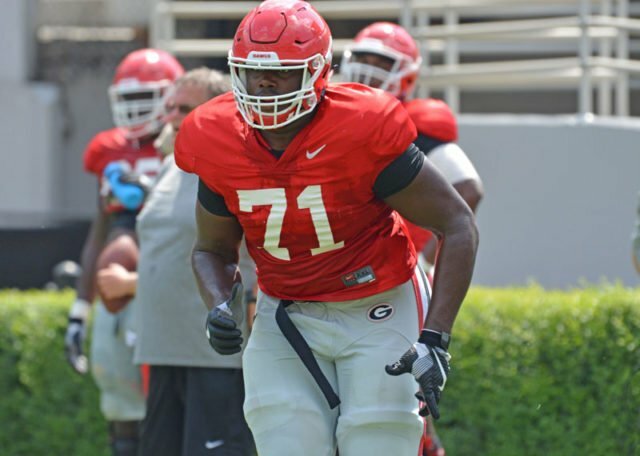 Thomas, a native of Lithonia, Ga., has gotten the starting nod at left tackle for 12 of the Bulldogs’ 13 games, only missing the Middle Tennessee State game with an ankle injury. He has anchored an offensive line that leads the SEC in Rushing Offense at 251.6 yards per game and that currently features one senior, two sophomores and two freshmen as starters. The Bulldogs are averaged 39.2 points per game during their second straight run to the SEC Championship Game and a their first invitation to the Sugar Bowl since 2008. Thomas and his offensive line unit were named a Joe Moore Award finalist for being one of the top offensive lines in the nation. 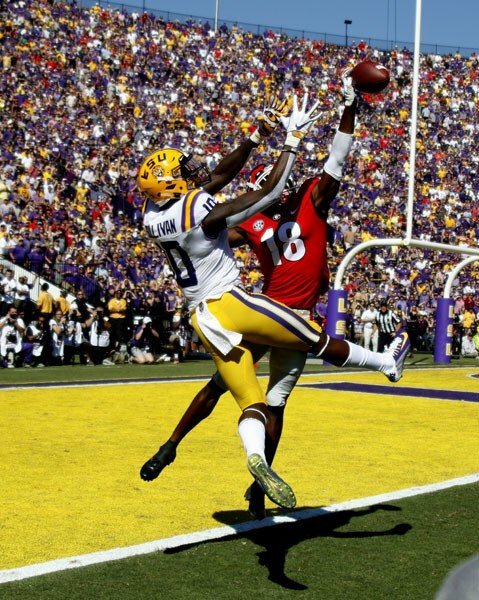 The Football Writers Association of America (FWAA) All-America teams are expected to be released later on Monday. The Sporting News All-America teams are scheduled to be released on Tuesday and the American Football Coaches Association (AFCA) teams on Wednesday. The No. 5 Bulldogs (11-2) will take on No. 15 Texas (9-4) in the Sugar Bowl in New Orleans, La., on Jan. 1 at 8:45 p.m. ET. ESPN will televise the fifth all-time matchup between the programs and the first matchup between the teams since 1984. Renowned list of coaches recognized for success on the field, as well as the classroom and community. ATLANTA (December 5, 2018) – Officials from the Bobby Dodd Coach of the Year Foundation and Chick-fil-A Peach Bowl have announced the finalists for the 2018 Dodd Trophy. Finalists include seven of the nation’s top coaches in college football who embody the award’s three pillars of scholarship, leadership and integrity, both on and off the field. This year’s finalists represent four conferences (ACC, Big 12, Big Ten, SEC), along with Notre Dame, and have combined for a 2018 record of 75-9 during the regular season. Overall, the seven coaches have a combined 88 years of head coaching experience, seven national championships and 781 career wins among them. Two former winners of The Dodd Trophy were included in the 2018 list with Nick Saban (2014) and Dabo Swinney (2011) being named finalists. Additionally, three of the coaches were finalists for last year’s award, including Pat Fitzgerald, Kirby Smart and Dabo Swinney. Winners of the award from the previous two years and first-year coaches at an institution are not eligible to be finalists. Finalists were selected by a panel consisting of all previous winners, national media, a member of the Dodd family and a College Football Hall of Fame member. The winner of the 2018 Dodd Trophy will be selected from the list of finalists by the Bobby Dodd Coach of the Year Foundation, and will be announced in Atlanta during Chick-fil-A Peach Bowl Week. The Dodd Trophy was established in 1976 to honor the NCAA Football Bowl Subdivision (formerly Division 1A) head football coach whose program represents the highest ideals on and off the field. The award honors the coach of a team which enjoys a successful football season, while also stressing the importance of academic excellence and character, as did Coach Dodd’s teams during his 22 years as head football coach of the Georgia Tech Yellow Jackets. Coach Dodd remains one of college football’s legendary figures, both as a coach and a player. Coach Dodd was a native of Galax, Virginia, and played his college ball at the University of Tennessee where his team had 27 wins, one loss and two ties during the three years he played. Coach Dodd was selected to the National College Football Hall of Fame both as a coach and as a player. Additional information about the Bobby Dodd Coach of the Year Foundation can be found at www.TheDoddTrophy.com. For news, updates and insider information, follow us on Twitter at @DoddTrophy or find us on Facebook at www.Facebook.com/DoddTrophy. About the Peach Bowl, Inc.
Peach Bowl, Inc. operates the Chick-fil-A Peach Bowl, one of the New Year’s Six Bowls selected to host the College Football Playoff. Last year, the Peach Bowl celebrated its Golden Season, including its 50-year history of traditions and successes as the nation’s ninth-oldest bowl organization. The Bowl has earned a reputation as one of the most competitive bowls in the country, with 54 percent of its games being decided by a touchdown or less. Peach Bowl, Inc. has disbursed $240.5 million in team payouts over its 50-year history. Peach Bowl, Inc. also leads all other bowl game organizations in charitable and scholarship contributions, giving more than $31.8 million to organizations in need since 2002. Peach Bowl, Inc. also runs the Chick-fil-A Kickoff Game, the Chick-fil-A Peach Bowl Challenge charity golf tournament, manages The Dodd Trophy national coach of the year award and led the relocation and financial foundation of the College Football Hall of Fame to Atlanta. For more information, visit Chick-fil-APeachBowl.com or follow us on Twitter at @CFAPeachBowl and find us on Facebook at Facebook.com/CFAPeachBowl. ATHENS, Ga. — The Bulldog offensive line unit has been named one of three finalists for the Joe Moore Award, which is given to the nation’s most outstanding offensive line unit. The Joe Moore Award voting committee will announce the selection of the award’s winner after a surprise visit to the winning university’s campus in late December. Alabama and Oklahoma join Georgia as finalists for the honor. The Bulldogs offensive line is led by Broyles Award semifinalist Sam Pittman. Pittman’s unit leads the SEC in Rushing Offense at 251.6 yards per game and most recently tallied 454 total yards on offense and 28 points versus No. 1 Alabama in the SEC Championship Game. 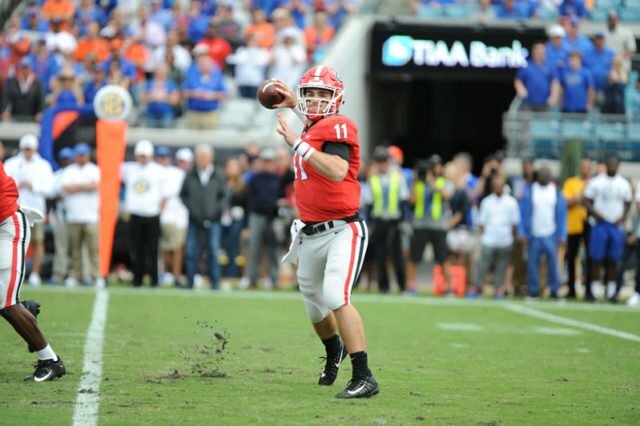 Georgia has started four different alignments on the line, including three freshmen and three sophomores, and has managed to average 39.2 points per game. Georgia is averaging 7.3 yards per play this season, which is the fifth most in the FBS this season and the highest mark in program history. The Bulldogs have gone three-and-out on just 9.6 percent of drives, also fifth lowest in the FBS. Georgia has averaged 6.4 yards per rush on first and second down, most in the SEC and fifth most in FBS. In addition, the Bulldogs racked up 250 rushing yards in eight games this season, which is tied for the most among Power-5 schools. Sophomore left tackle Andrew Thomas, who has started 12 of 13 games this season, was named a Coaches All-SEC First Team performer and a Second Team selection by the Associated Press on Tuesday. Senior center Lamont Gaillard has started a team-best 41 consecutive games and was also a Coaches First Team selection and AP Second Team selection. The No. 5 Bulldogs (11-2) will take on No. 15 Texas (9-4) in the Sugar Bowl in New Orleans, La., on Jan. 1 at 8:45 p.m. ET. ESPN will televise the fifth all-time game between the programs and the first matchup between the teams since 1984. BIRMINGHAM, Ala. (Dec. 4, 2018)—–Ten Southeastern Conference institutions placed a member on the 2018 All-Southeastern Conference Coaches’ Football First Team, as the first and second teams were announced Tuesday. Alabama led the way with 12 representatives, while Georgia had seven selections, and Missouri and South Carolina each had five. Twelve schools were represented on the first and second teams, while 11 institutions had at least two All-SEC selections. The 2018 list includes 11 student-athletes who have made multiple appearances on the All-SEC Team. Florida’s Martez Ivey was voted All-SEC for the third time, while Alabama’s Jonah Williams, Georgia’s Deandre Baker, Kentucky’s Benny Snell, LSU’s Devin White and Greedy Williams, Ole Miss’ Greg Little and A.J. Brown, Mississippi State’s Jeffery Simmons and Montez Sweat and Missouri’s Drew Lock were named to the All-SEC Team for the second time. ATHENS, Ga. — Georgia sophomore quarterback Jake Fromm has been named one of 11 finalists for the 2018 Manning Award, which is given to the nation’s top quarterback and the only award that takes candidates’ bowl performances into consideration. Fromm, a native of Warner Robins, Ga., joins two other signal callers from the Southeastern Conference as finalists and is one of three sophomores on the list. The winner will be announced after the bowls in January and will be honored at a ceremony in New Orleans. Fromm was named one of the Manning Award’s Stars of the Week following the Bulldogs’ 36-17 rout of No. 9 Florida on Oct. 27 in Jacksonville, Fla. He was 17-of-24 for 240 yards and three touchdowns as Georgia was on its way to sweeping the SEC East for the second year in a row. Overall, Fromm has started all 12 games for the No. 4 Bulldogs and is 161-for-233 for 2,236 yards with 24 touchdowns and only five interceptions. He is ranked third nationally on the active list for Passing Efficiency at 165.94 and is second in the SEC and eighth nationally in Completion Percentage at 69.1, which is on pace to pass Hutson Mason’s school record mark of 67.9 in 2014. Fromm is coming off a career-high four touchdowns on 13-for-16 passing for 175 yards during Georgia’s 45-21 dismantling of Georgia Tech on Nov. 24. The Bulldogs (11-1, 7-1 SEC) face No. 1 Alabama (12-0, 8-0 SEC) at the SEC Championship Game in Atlanta on Saturday at 4 p.m. CBS will televise the matchup between the defending league champions and the defending national champions. 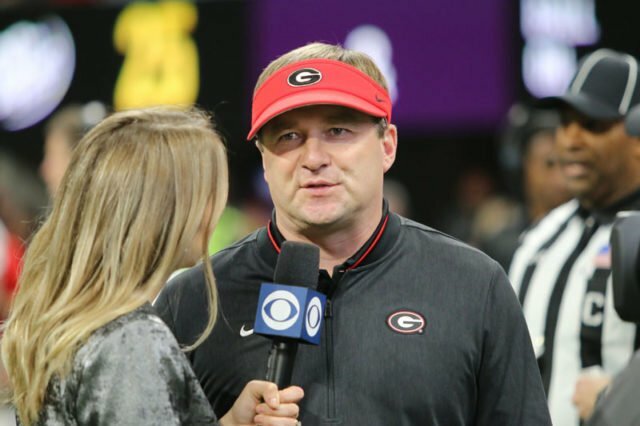 ATHENS, Ga. – Fourth-ranked Georgia held a two-hour workout Wednesday in preparation for its upcoming battle with top-ranked Alabama in the SEC Championship Game. The Bulldogs (11-1) and Crimson Tide (12-0) will meet Saturday for the 69th time overall but just the second time in an SEC Championship Game in Atlanta. In 2012, then No. 2 Alabama edged No. 3 Georgia 32-28 as the game ended with the Bulldogs at the Alabama five-yard line. 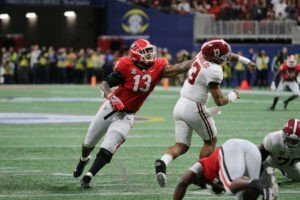 The teams last met to decide the 2018 College Football Playoff National Championship in Atlanta, and that game went to overtime as the Crimson Tide won 26-23. The Bulldogs are seeking to become back-to-back SEC Champions for the first time since a three-year stretch from 1980-82. Last year, the Bulldogs defeated No. 2 Auburn 28-7 for the SEC title. Georgia enters Saturday’s game averaging 40.1 points a game while Alabama checks in at 49.0 points a game, which ranks second nationally. 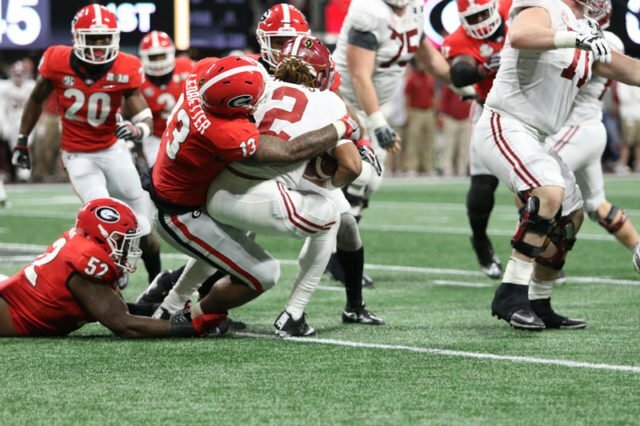 The Bulldogs scoring defense ranks 10th nationally, allowing just 17.2 points a game while Alabama is third nationally, surrendering only 13.8 points a game. 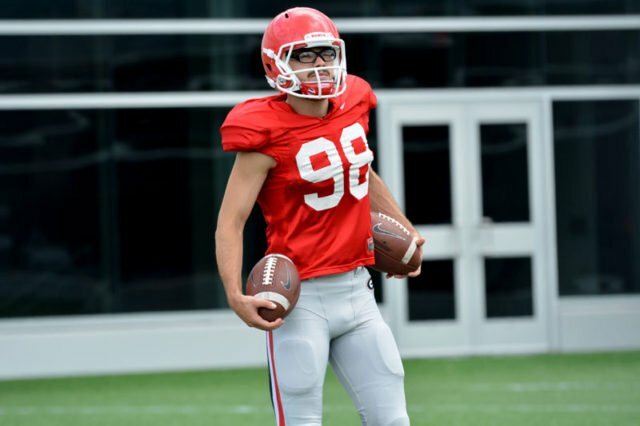 Also, on Wednesday, it was announced that Georgia junior place-kicker Rodrigo Blankenship has been named to the 2018 Southeastern Conference Community Service Team for football. The SEC names a Community Service Team for each of its 21-league sponsored sports, looking to highlight an athlete from each school who gives back to his community through superior service efforts. Blankenship, a native of Marietta, Ga., was the only player from the conference named to this year’s Allstate AFCA Good Works Team for his dedication to the community and performances on the field and in the classroom. After practice, junior tight ends Isaac Nauta and Charlie Woerner met with the media to discuss the week’s preparations. Kickoff at Mercedes-Benz Stadium Saturday is slated for 4:10 p.m. and be televised by CBS Sports and available on the Georgia Bulldog Sports Network. Additionally, Westwood One Sports and the SEC Radio Network will be broadcasting the game. BIRMINGHAM, Ala. — Georgia junior place-kicker Rodrigo Blankenship has been included on the 2018 Southeastern Conference Community Service Team for football as he and his teammates ready for the SEC Championship Game in Atlanta on Saturday. The SEC names a Community Service Team for each of its 21-league sponsored sports, looking to highlight an athlete from each school who gives back to his community through superior service efforts. Blankenship, a native of Marietta, Ga., was the only player from the conference named to this year’s Allstate AFCA Good Works Team for his dedication to the community and performances on the field and in the classroom. He is a member of the UGA Athletic Association’s Leadership Academy (L.E.A.D.) and has been a visitor at Camp Sunshine, which is a camp that provides support programs for children with cancer and their families. Blankenship has also volunteered for the “Empty Bowl” luncheon, which is a luncheon sponsored by the Food Bank of Northeast Georgia, and with the Extra Special People (ESP) group, which is an organization assisting individuals with developmental disabilities and their families. In addition to a number of other community service projects, Blankenship has been a spokesperson for “No More,” which is a public service announcement by UGA’s Student-Athlete Advisory Committee (SAAC) against domestic violence and sexual assault. The No. 4 Bulldogs (11-1, 7-1 SEC) take on No. 1 Alabama (12-0, 8-0 SEC) in the league’s title game on Saturday at 4 p.m. CBS will televise the matchup of the defending SEC champions and the defending national champions in the Mercedes-Benz Stadium. ATHENS, Ga. – The William Porter Payne and Porter Otis Payne Indoor Athletic Facility featured the two-hour practice of a University of Georgia football team bound for Saturday’s 2018 Southeastern Conference Championship. 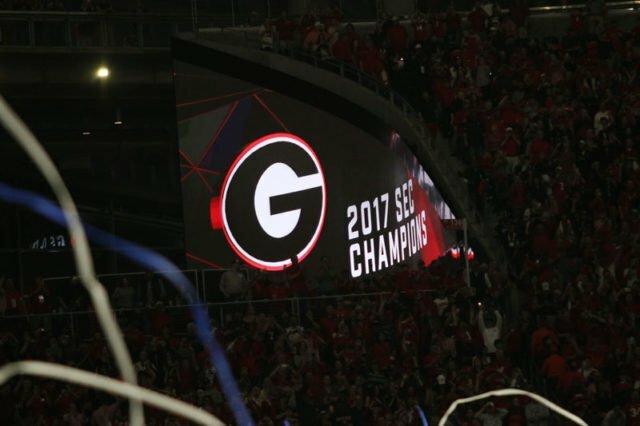 The Bulldogs’ trip to Atlanta marks back-to-back years Georgia has reserved the date at Mercedes-Benz Stadium for the SEC title. Last year, Georgia held Auburn to one touchdown in its 28-7 win. The victorious Bulldog team followed its conference title with a Rose Bowl Game win in Pasadena, California on New Year’s Day, before facing Alabama on January 8 for the CFP National Championship in the same Atlanta stadium. “I don’t think it’s only athletic; he resorts to that if things don’t go right, but he can sit in the pocket and make every throw. He’s very confident, and he’s got a presence about him in the pocket. He doesn’t fear rush; if he’s got guys bearing down on him, he sidesteps and gets the ball out, and that’s what makes him very special. He’s a really good dude.